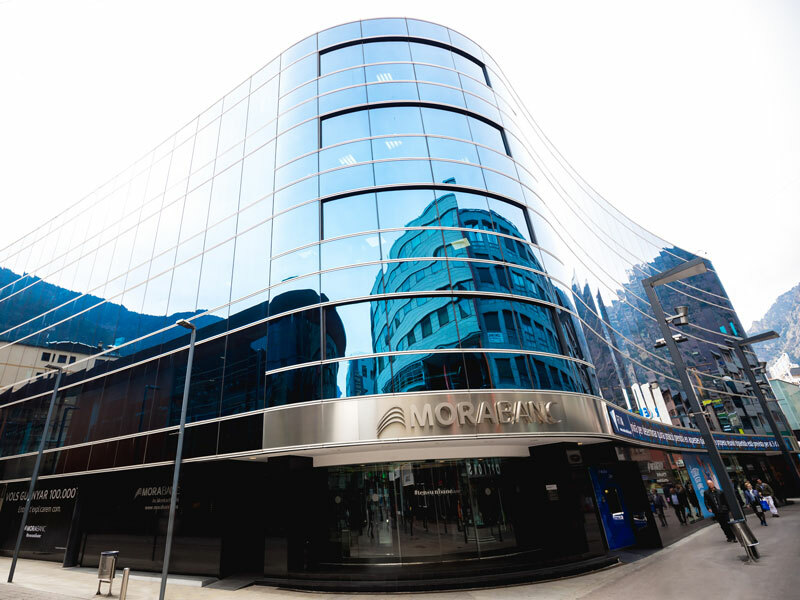 At MoraBanc, we always strive to be market leaders and to set an example for the digital banking sector in Andorra. For years now we have understood that, just as in most markets, both the present and future of banking hinges on the integration of digital culture with business. Confident of this significance, we were the first in Andorra to adapt through the introduction of the MoraBanc Digital project. One of the cornerstones of our transformation is maintaining our position at the forefront of a financial sector that’s in a constant state of flux. This investment has given us optimal results, leading World Finance to name MoraBanc the best digital bank and best mobile banking app in Andorra in 2017 and 2018. The first steps in our digital transformation have been a success, but what are the next challenges? When you make it this far, you know you can’t stop; you know that evolution continues and that if you do not move at the pace of the modern world, you get left behind. This is MoraBanc’s greatest challenge – to remain a leading bank in terms of technological innovation. A company’s digital mentality involves more than just technology – it’s also about its people. We know that to be digitally competitive, we need our banking team to take part in the transformation. In this regard, MoraBanc has changed a great deal over the last few years: in order to reach our digitalisation goals, we have incorporated technically trained individuals into specific digital banking tasks, and we have involved everyone in the bank in this transformation in one way or another. This way we can ensure the change will be a part of our DNA forever. The transformation of MoraBanc began on the inside, so that we could be different on the outside. We use agile methods to be more decisive and flexible. Consequently, we are able to put together specific tactical teams whenever needed in order to develop an across-the-board project with the necessary resources, at a faster rate than before. This ability to adapt has also been applied to our internal tools, including applications and programs such as Smartsheet, Jira and Trello, which allow the different players involved to follow each project while managing both technological and non-technological demands simultaneously. The MoraBanc team is now more digital than ever, and of course this feeds through to the products and services we offer our clients, as well as how we communicate with them. The use of multiple channels ceased to be an option and became a necessity some time ago. Accordingly, we have built and developed various new tools and platforms, such as MoraBanc Direct, which give clients the autonomy to manage their account without having to travel to a branch. They do not lose contact with the bank at any point either, as a personal manager attends to any needs through a range of contact options (telephone, safe chat and email). Our online banking system and app for smartphones and tablets are constantly being improved: in 2018 alone, over 25 projects were completed. Among them were the implementation of advanced digital signatures, an internal notification management module connecting clients and managers, and online chats. In addition, there is a mobile broker for smartphones, a push safety and account alert service, and the option to pay for card operations in instalments. All around the world, bank clients are becoming digital. This is an unstoppable process, but MoraBanc is working hard to support and enable the change. Digital evolution never stops. New technologies soon cease to be innovative, while incorporating or developing the structures to promote their application is not easy, and is often not even viable. In order to be digital leaders, MoraBanc keeps contact with the groups, entrepreneurs and companies that are already a step ahead of the pack. With them, we pay close attention to potentially game-changing technologies that may help our business stand out. We work to offer the best service available today and prepare the tools that will make a difference in the future. In terms of innovation, we are developing a support programme for entrepreneurs in partnership with the prestigious project accelerator Ship2B, which is based in Barcelona. We do so partly because this project is essential to our commitment to the development of both entrepreneurs and society, and partly because it allows us to stay in contact with Andorra’s entrepreneurs and to benefit from their ideas and vitality. We also look for partners that can respond to the bank’s specific projects and needs without expanding the organisation’s permanent structure more than is necessary. We work with fintech firms such as: Inbenta, which helps us to use artificial intelligence in our search engines; QuickBlox, which provides us with the latest proposals to improve client-manager chats; and the Web Financial Group, which acts as a motor for our Broker Online project. We are also in the Andorran ANDBlockchain commission, which is dedicated to blockchain technology. Meanwhile, we are present in various business associations in Andorra, including the ACTinn initiative – promoted by the Andorran Government in its Smart Country project. Indeed, we can’t do it all in such a specialised world, and it is often valuable to surround yourself with the most notable and innovative profiles in each area in order to apply the best, most up-to-date proposals in each case. MoraBanc Digital is a project that we could not successfully introduce without the global transformation of the bank and its teams. We have redesigned the way we do banking, responding to the demands and expectations of today’s clients; the figures prove our success in this respect. The numbers show that our clients have welcomed our digital service and multiple channels, as we have seen a 24 percent increase in online banking entrances and there has been a 43 percent increase in money transfers following the launch of the projects. Indeed, when comparing indicators, we see that the most frequent transactions have all increased significantly. We can no longer say the future is digital: for some time now, the present has been digital. At MoraBanc, we have made digital culture a part of our day-to-day routine, with a permanent investment in both technology and people. The results show that all this is worthwhile: the world is digital, and so is MoraBanc. Having adopted this culture, MoraBanc plans to keep up the trend of profit growth, which began in 2017. This is the main objective of the new strategic plan for the next three years, which the bank has recently unveiled. Growth continued in 2018 and, thanks to this new strategic plan, it will be reinforced over the coming years. MoraBanc’s plan for the future is ambitious, but it is still feasible because of our very clear direction and talented team. Over recent years, the team has shown that it is capable of achieving established objectives. Now we are working to expand, particularly within the Andorran market. The strategy is based on three main pillars. The first relates to business growth: in Andorra, the market in which MoraBanc’s main commitment and focus lies, new client segmentation, ongoing improvement of our value proposal, the granting of loans and the management of private banking clients are the main aspects of this line of growth. International growth is also forecast, in line with the trend set over recent months: between January 2017 and June 2018, client funds of our Zurich and Miami subsidiaries rose by 14 percent, and now represent 30 percent of the group’s total funds. Productivity and investment in technology are two other key features. In 2017, MoraBanc reduced its costs by 22 percent compared with 2016. Over the next few years, digital banking will be strengthened further and processes will be simplified in order to become even more efficient. In 2015, the banking industry in Andorra experienced some of its most challenging times, with a change in strategy and subsequent increase in international prominence. At the time, MoraBanc began a transformation plan to adapt to this new reality. With significant investment and personal effort, we committed to digitalisation, cost optimisation and adaptation to regulatory requirements with the utmost speed. The results for the 2017 financial year supported this decision, with profits rising by 3.6 percent, proving that we have a strong foundations. Now, a new stage is under way, with ongoing growth being the main objective.